A previous version of this post misstated the Navy’s reliability requirement for the Advanced Arresting Gear. The requirement is 16,500 recoveries before an operational failure. ABOARD AIRCRAFT CARRIER USS GERALD R. FORD – The crew of USS Gerald R. Ford (CVN-78) are slowly expanding the aircraft they can launch and recover from the next-generation aircraft carrier, Ford’s air boss told USNI News last week. By the end of the year, the Navy hopes to have all of the technical information it needs to launch and recover every configuration of the F-18E/F Super Hornet and EA-18G Growler from Ford. 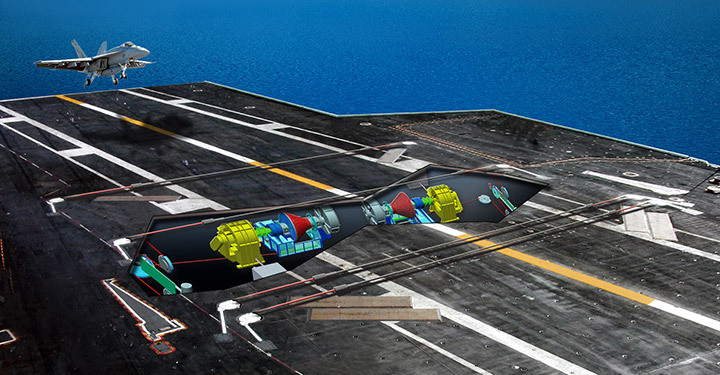 The creation of the so-called launch and recovery bulletins for the carrier’s Electromagnetic Aircraft Launch System (EMALS) and Advanced Arresting Gear (AAG) will allow fleet aviators and aircraft to operate from Ford. “In a couple of months, they are on a path to publish the fully fleet-representative recovery bulletins that will give us the capability to recover any weapons configuration which F-18 or a Growler can have on a Nimitz-class,” Cmdr. Mehdi Akacem told reporters last week on the deck of the carrier. Ford is set to leave Newport News Shipbuilding in July following the completion of a post-delivery maintenance availability and head back to sea for more testing. Out of all of the next-generation technologies on Ford, the AAG, built by General Atomics, has been the most troublesome for the Navy. Early versions of the system installed at test facilities did not meet required reliability levels and prompted an extensive redesign for follow-on versions that delayed land testing by two years. The delay pushed testing aboard Ford back two years and created a reliance on an AAG system installed at a test facility at Joint Base McGuire-Dix-Lakehurst, in Lakehurst, N.J.
At sea, Ford has conducted 763 landings with test aircraft with the AAG and seen ten failures during testing – far higher than the Navy’s requirement of 16,500 recoveries before an operational failure, according to the recent Pentagon director of operational test and evaluation (DOT&E) report. “They are doing the envelope expansion there. They have the test pilots flying into a real AAG setup built into a runway,” Akacem said. According to DOT&E, the Navy has used the Lakehurst Jet Car site for 2,230 AAG arrestment tests as of the end of September. In the same period, the AAG at the Runway Arrested Landing Site, also at Lakehurst, had 928 arrestments with manned aircraft. 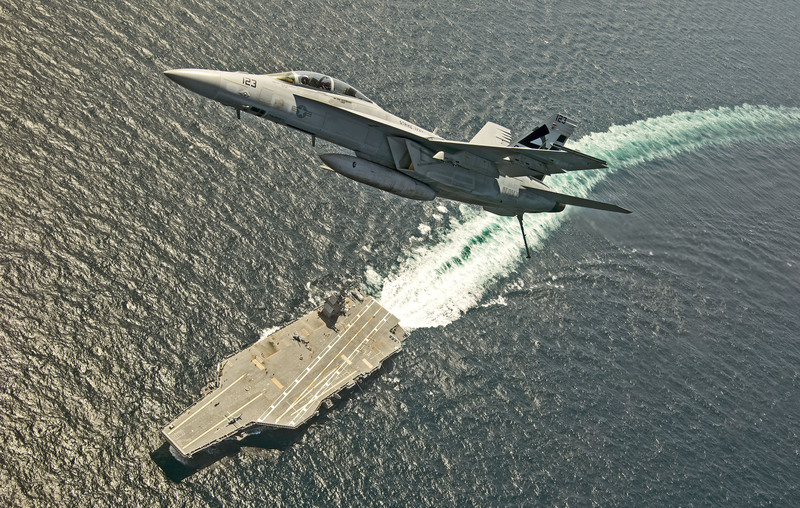 EMALS and AAG are two of several key technologies that differentiate Ford from the older Nimitz-class carriers. The collective goal of the technologies is to boost the sortie generation rate – the number of aircraft the carrier can launch – by 25 to 30 percent over the Nimitz-class rate while reducing manning. Other components have met with delays. For example, only one of the 11 Advanced Weapons Elevators on Ford have been certified for operations, with the second one to be approved later this month. Chief of Naval Operations Adm. John Richardson told reporters last week aboard Ford that the delays in technology are largely under control and the service is now thinking about the future possibilities of the ship class. “Our minds need to be captivated now by the larger matters that are before us in terms of the USS Gerald R. Ford in terms of how are we going to use this amazing platform to move and open up our superiority at sea in operations and warfighting context,” Richardson said.